Terry and the Pirates was the best comic strip ever. And I'll fight anyone--all at once or one at a time--who dares disagree with me. 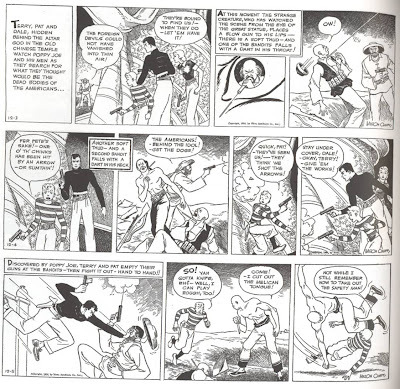 The strip was created in 1934 by Milt Caniff, who continued as writer/artist through 1946. After this, he left the strip and created Steve Canyon. Terry continued on until the early 1970s, but it was never as good as it had been during the Caniff years. 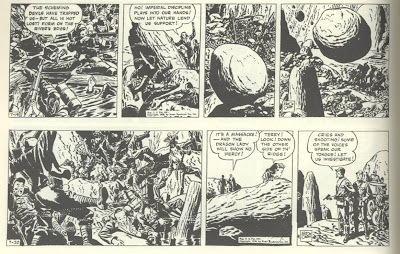 Caniff was a superb storyteller, using both dialogue and visuals to build exciting adventure stories infused with realistic, memorable characters. 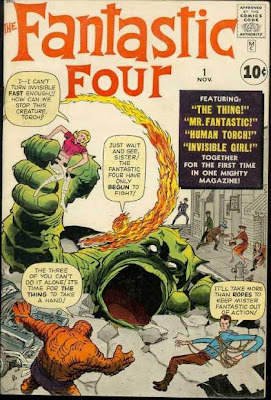 The main character was a young orphan named Terry Lee, who comes to China with his guardian (Pat Ryan--an aspiring writer who is quick with both his fists and his wits). In their initial adventure, Terry & Pat are looking for a gold mine willed to Terry by his grandfather. 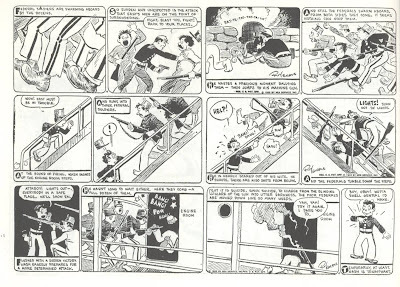 This doesn't work out too well and Terry and Pat spend most of the 1930s bouncing around the Orient, battling bandits, thieves, con artists and invading Japanese soldiers. Reoccuring characters (most notably those of the drop-dead gorgeous female variety) come and go throughout the strip. Terry aged normally through the years, so he was old enough to enlist after Pearl Harbor. 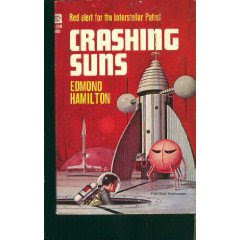 He ended up flying fighter planes, but got himself dropped into the middle of an occassional espionage plot as well. The feel of the strip during the war years is inevitably different than it had been during the free-wheeling 1930s. But the quality of the stories and the artwork remain just as high. 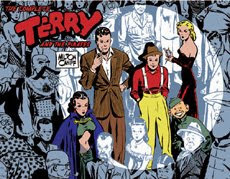 Currently, a company called IDW is in the middle of publishing a 6-volume set containing all the Caniff Terry and the Pirates strips. 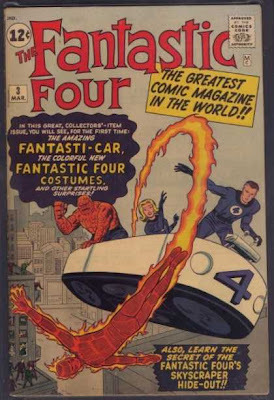 Volume 4, which includes a very emotional storyline involving the death of a key character, has just become available. The individual volumes are priced a little high, but they are worth it. If you can't afford them--understandable in these times--at least request that your public library acquire them. 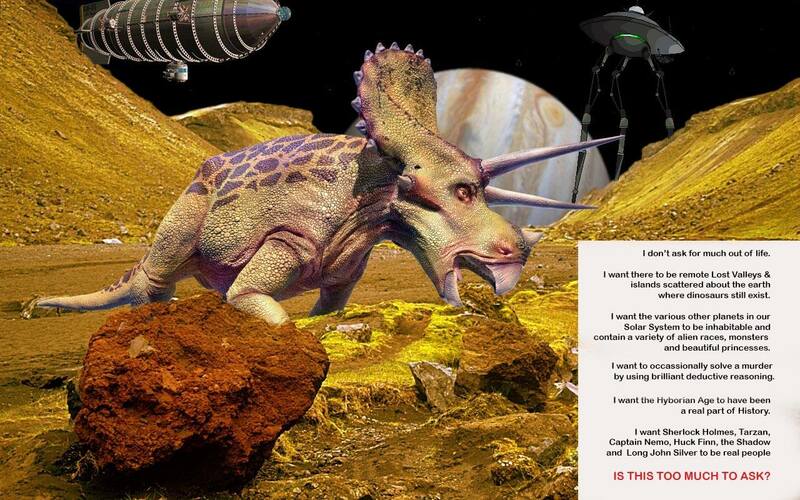 In any case, Terry and the Pirates is must reading. When DC got the rights to do a Shadow comic book in 1973, they immediately did four things exactly right. 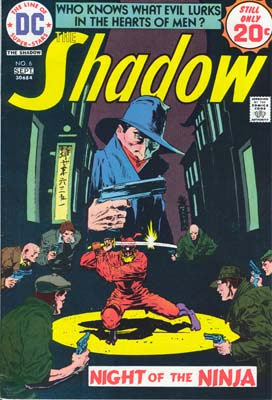 First, they did the pulp magazine version of the Shadow rather than the radio version. These were indeed two distinct characters. 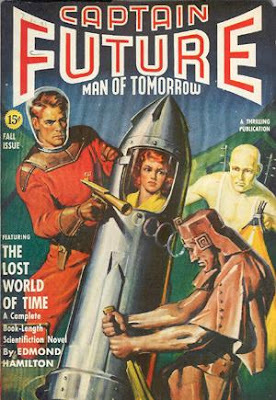 The radio guy, whose show ran from 1938 to 1954, was wealthy man-about-town Lamont Cranston, who had the hypnotic power to "cloud men's minds so they could not see him." Along with his "friend and companion, the lovely Margo Lane," he investigated crimes, using his invisibility to uncover clues and often psych out the bad guys. 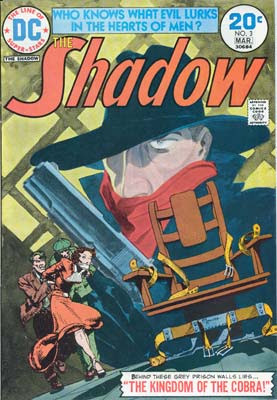 In the pulps, which were published in the 1930s and 1940s, Cranston was only one of several identities used by the Shadow. He couldn't literally turn invisible, but was very good at lurking in the shadows. Dressed in a slouch hat and dark cloak, he employed a network of agents to help him collect information and confronted villainy with a pair of blazing .45 automatics. Both versions of the Shadow are excellent, but the pulp character had more visual appeal. The covers of the original Shadow Magazines, usually done by artist George Rozen, were consistently superb and provided numerous examples of just how cool the pulp Shadow looked. 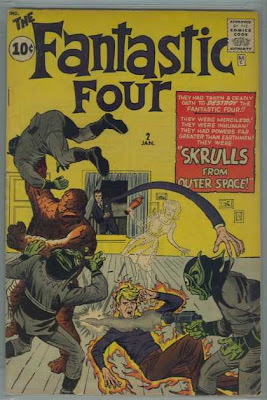 So--given the choice between a vivid, dramatic image of the Shadow, cape bellowing in the wind as he blasts away with his pistols, or the image of a guy you, um, well, can't see--then the pulps are definitely the way to go. The second thing they did right was to get Denny O'Neil, veteran Batman writer, to script the book. The Shadow was one of the major influences for the creation of Batman, so it was safe to say that O'Neil was just the right man for the job. 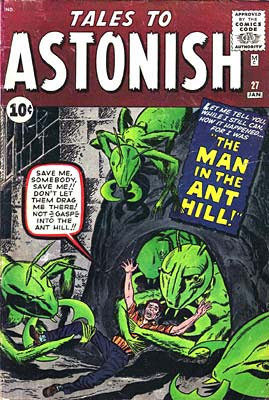 O'Neil had done many single issue stories starring Batman that had effectively mixed the detective story genre with comic book action. He did the same thing with the Shadow. A crime (or series of crimes) would be committed. The Shadow and his agents would investigate, following up clues in a logical manner or employing deductive reasoning to solve the crime. Along the way--and at the finale--there'd be several exciting, well-choreographed action sequences. It was an effective and entertaining storytelling method that worked as well for the Shadow as it did for Batman. 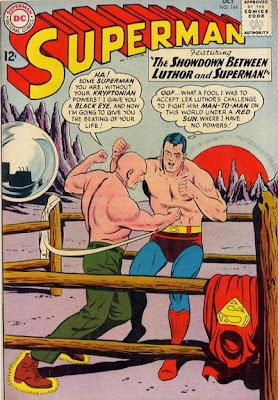 The third thing DC did right was to keep the Shadow in the 1930s, where he clearly belongs. Some characters, like Batman, can survive updating, but the Shadow was a product of his era. Take him out of that time, as artist/writer Howard Chaykyn tried to do later on in an awful 1980s series, and he just isn't the Shadow anymore. Robin Hood belongs in medieval Sherwood Forest; the Lone Ranger belongs in the Old West; and the Shadow belongs in Depression-era New York. 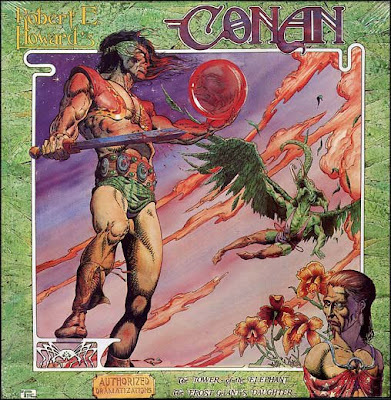 Finally, DC got Mike Kaluta to do the art work. Kaluta was perfect for the job--his visuals dripped with authenticity, suspense, menace and violence. He caught the look of the times and the look of the Shadow perfectly. 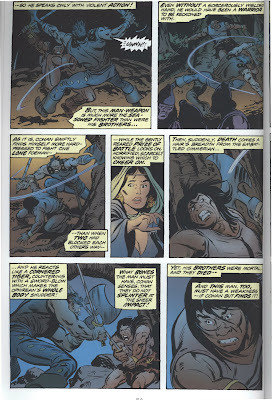 Sadly, the Shadow only ran a dozen issues and Kaluta only did the art for five of those issues. But those five stories are wonderful. 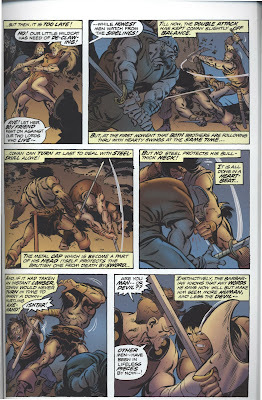 In addition to the reasons stated above, O'Neil and Kaluta also managed to give each story a unique setting for its grand finale. In the first issue, the Shadow confronts a gang of thugs attempting to blow up the George Washington Bridge. 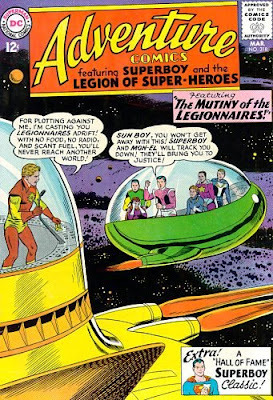 In the next issue, he and Margo Lane join a carnival to catch the bad guy, then battle him aboard a moving train. Future issues feature encounters in a grave yard, the death house of a prison, and the narrow streets and dark alleys of Chinatown. The stories never fell into a rut, either in terms of plot or in terms of visuals. It's sad that the book didn't run longer. I don't deal with TV that often on this blog, but if you jump back far enough, you can find shows worth talking about. 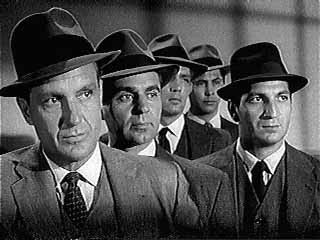 One such show was The Untouchables, which ran on ABC from 1959 to 1963. The original pilot was very loosely based on the real-life activities of Treasury agent Eliot Ness, who battled Capone's illegal booze operations in Chicago in the early 1930s. Ness put together a small team of agents who were known to be honest--hence their collective nick-name. 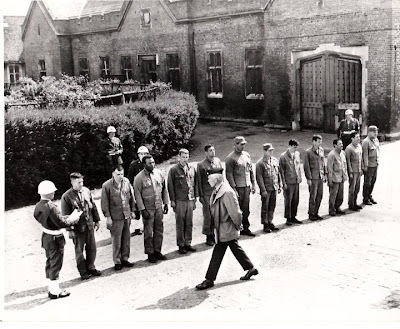 In later episodes, the TV show largely ignored reality, sending the Untouchables against both historical and fictional criminals in a series of violent, melodramtic stories. With good writing, beautiful black-and-white photography and a succession of skilled character actors guest-starring as the various gangsters, witnesses and victims, The Untouchables earned its status as a classic TV series. The series jumped almost hapharzardly back and forth through time, without paying attention to internal continuity. For instance, the character of reoccuring villain Frank Nitti (played by Bruce Gordon) was killed off near the end of the first season. But Gordon was back playing Nitti in the second season, through the simple method of having particular episodes set earlier in the 1930s. This caused some minor continuity glitches on occasion--a newer member of the Untouchables, for instance, might inexplicably appear in an episode set before he had actually joined the team. But for the most part, the lack of internal continuity was a strength rather than a weakness. 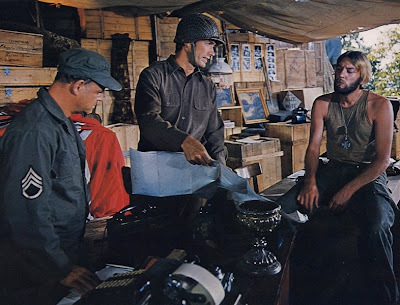 It allowed the producers and writers to craft single-episode stories that can each stand on its own. And, of course, aside from good writing and characterizations, there were those really cool gun battles. I think I mentioned this a few months ago when talking about the Cagney movie G-Men, but it's worth saying again. There are few things more entertaining to watch than black-and-white movies or TV shows featuring 1930s-era tough guys blasting away at each other with tommy guns and revolvers. Now I've got that song stuck in my head!!!! But at least it's a great song. Give it a listen and hear for yourself. In the summer of 1951, Jack Webb produced and starred in a radio show called Pete Kelly's Blues. Webb played Kelly--the head of a small Prohibition-era jazz band that worked in a Kansas City speakeasy. Filled with snappy, hard-boiled dialogue (something Webb excelled at on radio) and superb jazz music, it's one of the highlights of old-time radio. 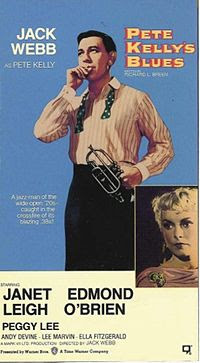 In 1955, Webb got a chance to direct and star in a movie version. And it is a fun movie--involving Pete Kelly's efforts deal with a gangster who "encourages" the band to sign him up as an agent. Before long, Kelly's drummer gets caught in a blast of tommy gun fire and things get really dangerous for everyone else. As with the radio show, the movie is overflowing with snappy dialogue and addictive jazz music. Both Ella Fitzgerald (as a singer in a small booze-joint) and Peggy Lee (as the alcoholic girlfriend of the gangster) belt out some great songs. The movie just recently came out on DVD and it's worth watching. Just expect to have to deal with at least one of the songs getting stuck in your head for days afterwards.